This week on BSDNow – It’s getting close to christmas and the presents seem to be dropping early! 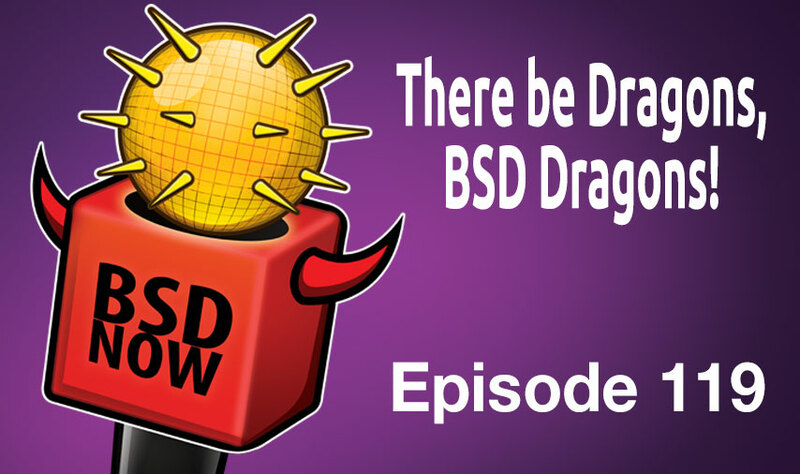 We have a new DragonflyBSD release, loads of news, and an exciting interview with NetBSD developer Paul Goyette coming your way right now! “mpi@ came with patch (sent to priv. list only currently), which adds a new lock for PF. It’s called PF big lock. The big PF lock essentially establishes a safe playground for PF hackers. The lock currently covers all pf_test() function. The pf_test() function parts will be gradually unlocked as the work will progress. To make PF big lock safe few more details must be sorted out. The first of them is to avoid recursive calls to pf_test(). The pf_test() could get entered recursively, when packet hits block rule with return-* action. This is no longer the case as ip_send() functions got introduced (committed change has been discussed privately). Packets sent on behalf of kernel are dispatched using softnet task queue now. We still have to sort out pf_route() functions. The other thing we need to sort out with respect to PF big lock is reference counting for statekey, which gets attached to mbuf. Patch has been sent to hackers, waiting for OK too. The plan is to commit reference counting sometimes next year after CVS will be unlocked. + AutoNUMA, A kernel task routinely iterates through the allocated memory of each process and tallies the number of memory pages on each node for that process. It also clears the present bit on the pages, which will force the CPU to stop and enter the page-fault handler when the page is next accessed. In the page-fault handler it records which node and thread is trying to access the page before setting the present bit and allowing execution to continue. Pages that are accessed from remote nodes are put into a queue to be migrated to that node. After a page has already been migrated once, though, future migrations require two recorded accesses from a remote node, which is designed to prevent excessive migrations (known as page bouncing). + Memory collocation, Moving memory to a different node so that accesses will likely be local. + Replication, Copying memory to several nodes so that threads from each node can access it locally (useful for read-only and read-mostly data). + Interleaving, Moving memory such that it is distributed evenly among all nodes. + FreeBSD is slowly gaining NUMA capabilities, and currently supports: fixed, round-robin, first-touch. Additionally, it also supports fixed-rr, and first-touch-rr, where if the memory allocation fails, because the fixed domain or first-touch domain is full, it falls back to round-robin. Larry Cafiero continues to make some news about his switch to PC-BSD from Linux. This time in an blog post titled “Is that Linux? No, its PC-BSD” he describes an experience out and about where he was asked what is running on his laptop, and was unable for the first time in 9 years to answer, it’s Linux. The blog then goes on to mention his experience up to now running PC-BSD, how the learning curve was fairly easy coming from a Linux background. DragonFly BSD has made its 4.4 release official this week! Looking for a webmin-like interface to control your FreeBSD box? Enter Ajenti, and today we have a walkthrough posted on how to get it setup on a FreeBSD 10.2 system. The walkthrough is mostly straightforward, you’ll need a FreeBSD box with root, and will need to install several packages / ports initially. Because there is no native package (yet), it guides you through using python’s PIP installer to fetch and get Ajenti running. The author links to some pre-built rc.d scripts and other helpful config files on GitHub, which will further assist in the process of making it run on FreeBSD. Ajenti by itself may not be the best to serve publically, so it also provides instructions on how to protect the connection by serving it through nginx / SSL, a must-have if you plan on using this over unsecure networks. BSDCan 2016 CFP is up! Are you running a big farm that does something interesting? Is your university research using BSD? Do you have an idea for a great new subsystem or utility? Have you suffered through some horrible ordeal? Make sure the rest of us know the best way out when it happens to us. Did you build a radar that runs NetBSD? A telescope controlled by FreeBSD? Have you run an ISP at the north pole using Jails? Do you run a usergroup and have tips to share? Have you combined the features and tools of a BSD in a new and interesting way? Don’t have a talk to give? Teach a tutorial!